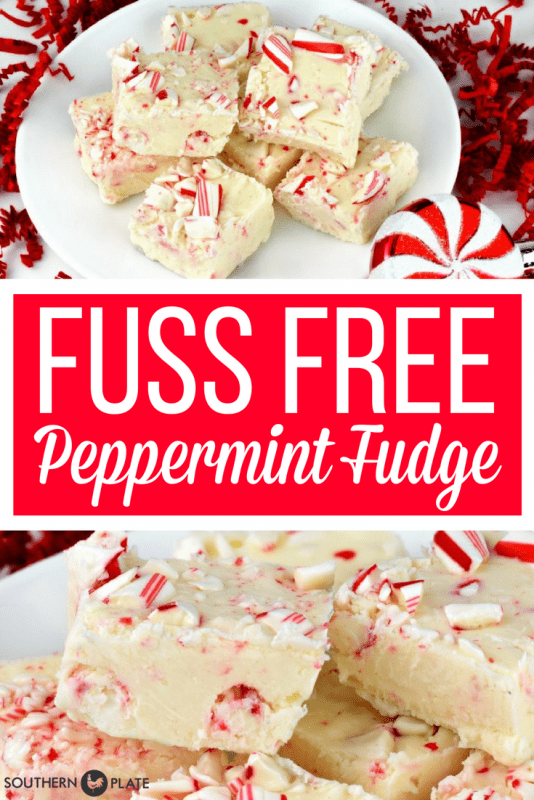 Save time, energy and money with this quick and easy Fuss Free Peppermint Fudge! When we got married, my husband thought the only place you could get fudge was in a candy kitchen in the smoky mountains. He had no idea that the best fudge came from your own kitchen! Everyone in my family dearly loves fudge but I usually make it only during the holidays, with the rare treat for a birthday or other occasion where it is specially requested. The main reason for this is that the fudge I love is a good bit of work. However, the basic recipe for this fudge is a game changer – and it is adaptable to countless variations. 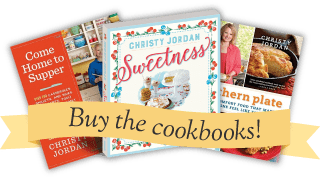 If you’re looking for some great Christmas gift ideas, I am also publishing my 2016 Gift Guide today, filled with practically and budget friendly gifts that are sure to please just about everyone on your list. Click here to see that. The recipe for this fudge is ready for you to print off below, enjoy! In microwave safe bowl, place vanilla chips. Microwave at one minute increments, stirring after each, until melted and smooth. Open icing container and remove foil lid. Place in microwave for about one minute. Stir into melted morsels until well blended. 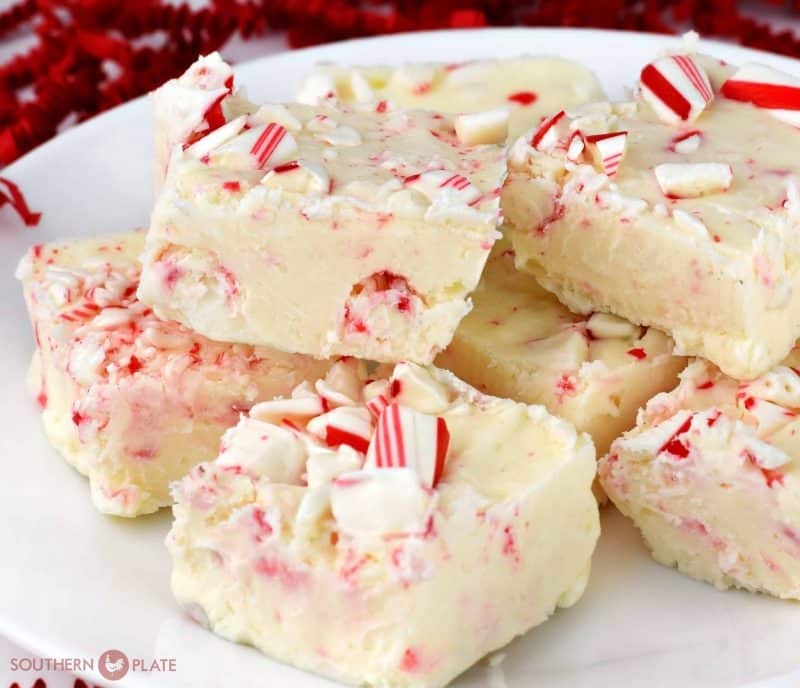 Stir in peppermint oil, if desired, and then add crushed candy canes. Pour into greased 8x8 pan and allow to cool completely before cutting. * You can use Duncan Hines or Betty Crocker or even Aldi’S brand of icing. I’ve used them all. ~Bea Ezell, Submitted by Cindy Roadman. Could I substitute a 12 oz pkg of almond bark or candyquick for the vanilla morsels? Sounds great! Can you substitute chocolate icing and chocolate chips? Our favorite is chocolate fudge with pecans. Loved your gift list. Thanks for making it. I just love you Alexandra!!! I will have to try this. I love peppermint. I know I will have to be careful! I hope you enjoy it Shannon!!! I did this last year with canned pistachio icing, white chips, and chopped pistachios. I have also done it with candied chopped cherries and cherry icing, and on and on. Love to make a bunch and wrap a bar of each for a box for Christmas gifts. Always goes over BIG! Not a fan of peppermint. Oh my goodness, I bet that was good!!! Oh those sound wonderful! I have only made the “old fashioned” cook on the stove kind of fudge. I will have to try these variations! I usually make plain chocolate, chocolate w/pecans, peanut butter, and chocolate/peanut butter fudge as well as other candy and cookies to make boxes for gifts for Christmas. Sounds wonderful and super easy. Curious if something is left out, tho, because in the Ingredients list, the icing has an asterisk after it but I don’t see any info linked to that. What am I missing? Thank you for asking this! I’m going crazy looking for the * and what it’s referring to!! I replied to another comment with this before I went to bed last night, sorry y’all missed it and had to wonder! I’ll go add it into the post now. My earlier reply: Oh I meant to say you can use Duncan Hines or Betty Crocker or even Aldi’S brand. I’ve used them all. LOOOOOVE this fudge Christy! Some folks are just so clever who come up with the ease of this ‘fun’ treat. I’ve made it with peanut butter and chocolate, but never have done peppermint. That’s about to change. Thanks! Thank you!! Can’t wait to hear how you like the peppermint!! Can you use peppermint extract instead of the oil?? Every time I see peppermint I am reminded of the beautiful white cupcakes with crushed peppermint topping that I made for an office party one year. I was horrified when I walked in at party time to find my cupcakes sitting on the table with the peppermint bleeding all over the cupcakes!!!! They looked more halloween than Christmas!!! I live in the humid south, how do you keep the peppermint from bleeding ? Thank you for this awesome recipe. This will surely end up in several of my family’s Christmas tins. What would I have ever done if I hadn’t found you!! Aww, thank you so much Kim!!! This sounds so good but we do not have a microwave. Can this be made on the stove? Would I need to add anything to the pan so not to burn the chips? You can make this on your stove top, but you need to use a Double Boiler. If you don’t have a Double Boiler, set a small pan into a larger pan. Put some water into the large pan, but make sure the water level is low enough as not to boil into the pan on top. Heat the water to a low boil or simmer. Put your chips in the pan on top, and melt over the simmering water, stirring often until melted. Melt your frosting the same way. Christy, I am definitely going to have to try this! I’ve only made the “old-fashioned” Easy fudge that you cook on the stove. I get tired of stirring it while it is boiling for the 4-5 minutes. That is all that my mom ever made. I have learned from a tip I saw on pinterest, to use the mixer to stir all of the ingredients in after removing from the stove. It sure saves a lot of time and effort. and works great too! A lot of people never even try to make fudge thinking it is too hard to make. I would need to make a 13×9 pan or two 8×8 pans of this recipe to have enough to put into my Christmas boxes for friends and family. I usually make a 13×9 pan of each kind of fudge plain chocolate, chocolate w/pecans, peanut butter, and peanut butter/chocolate mixed. I think the most requested kind is peanut butter from my friends although they like all of it. Thanks for all of the awesome recipes you share with us!! I can’t wait to hear what you think about it Donna!!! I am so glad you liked it Blanche!! Was wondering your thoughts on using a can of sugar free icing along with a bag of sugar free chocolate chips? Looking for a way to eat fudge without all the sugar! I am not sure, but I think you might be on to something here. It would definitely be worth trying to see if it turns out correctly or not!!! 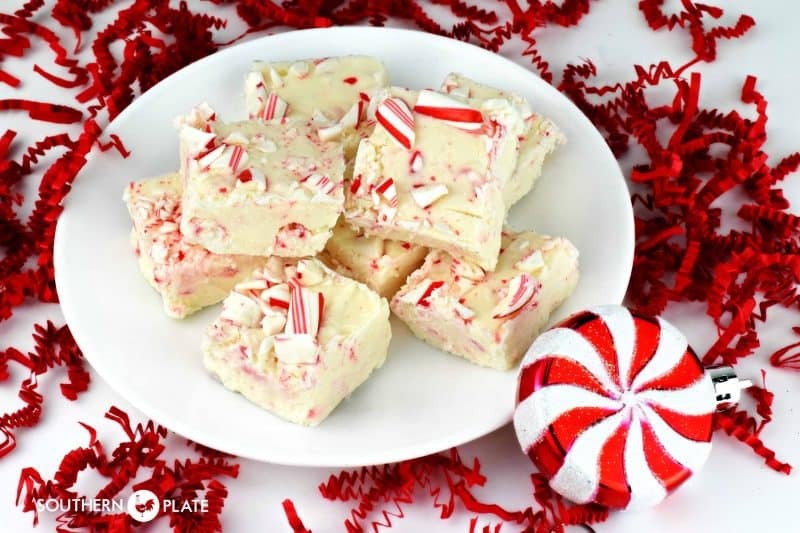 Is peppermint oil the same as peppermint extract in this recipe? Wondering if I can substitute peppermint extract? Can homemade cream cheese frosting be used instead of store bought in the fuss free peppermint fudge? I have never made it that way, but I am sure it would probably work. How far in advance can I make this fudge. At least two weeks. Just keep it in an airtight container. I made peanut butter fudge using this recipe with peanut butter chips and Sugar Free cake icing. It was a hit with my family. One of my adopted dad’s loved it could believe what it was made from. As Uncle Ronald would say this recipe is a keeper. Thanks Christy you are such a blessing! I am so glad to hear it was a hit!!!! Do you have to refrigerator the fudge so it can set as well as leaving it in the fridge after it is made. It sounds very good and extremely easy to make. Can’t wait to try it. Can I use peppermint extract instead of peppermint oil? Have a great day. What did I do wrong? The white chocolate chips didn’t melt until smooth. I kept heating 1 minute intervals until it started to turn brown. Hey Jane! Sounds like it heated a little too fast so that the outside started to cook before the interior was hot enough to melt fully. It may be the microwave or the type of bowl that contributed. I would heat in one minute intervals, stir and wait a minute, then repeat, pausing a minute or so each time to allow the heat to distribute. If you have a stoneware bowl that may help as well. It was still very good and got compliments at church dinner. I may try doubler boiler next time or half power on microwave.